Pulling a muscle or your back is probably the most common injury associated with shoveling snow… Both are very much avoidable. Always stretch before beginning, warming up those muscles beforehand will help steer clear of an injury. To begin, stand with your feet shoulder width apart. Always bend with your knees. When you use your back to lift, is when you end up hurt… So don’t! Use your core to do the lifting. Once the filled shovel is up do not twist your back to place it in a pile. Walk it over, keeping the shovel close to your body and lined up with your legs and chest being careful not to slip. If possible try and avoid lifting all together, push the snow into place. If you are dealing with wet, heavy snow, take less in each load. Listen to your body. Take breaks when needed and stay hydrated. I know we all try and get out of shoveling at work… especially if we have to go home and do it as well. However some of you may get a pass. 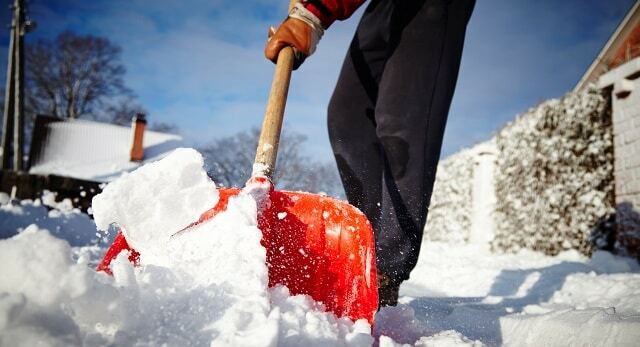 If you have a history of heart attacks, other heart issues or high blood pressure you should skip the shoveling. Get another worker to do it and at home get a snow blower or think about hiring the neighborhood kid. Heavy smokers may also want to consider an alternative. Shoveling snow is just a part of life here in Canada but the injuries associated with it don’t have to be. Always follow safe shoveling procedures and take your time. There is no point in rushing, you’ll probably just have to do it again tomorrow.